Rubab or robab (Persian: رُباب) is a lute-like musical instrument from Afghanistan, Iranian Beluchistan and North Western Pakistan. 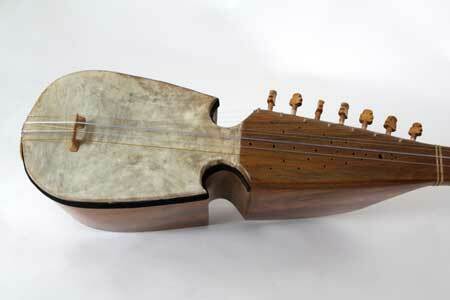 There are many diffenret translitration for this instrument like Rabab, Rebab, Robab or Rubab. The robab is a short-necked lute whose body is carved out of a single piece of wood, with a membrane, covering the hollow bowl of the sound-chamber, upon which the bridge is positioned. It has three melody strings tuned in fourths, three drone strings and 11 or 12 sympathetic strings. The instrument is made from the trunk of a mulberry tree, the head from thin goat skin and the strings either gut (from the intestines of young goats, brought to the size of thread) or nylon.